Sometime during my pregnancy, I decided to do some crafty things, and I did them! I really did. But, as you all know, I either didn't have a good camera lens, or I was totally lazy about processing and posting photos. 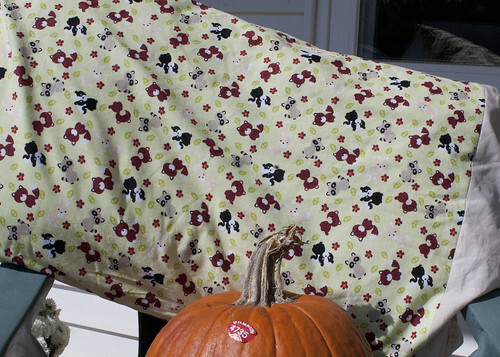 So, this photo of a pillowcase I made for N is from October. October. I'm embarrassed. In fact, I'm even more embarrassed by the fact that I had this fabric for so long. But, at least N likes it. He sleeps with it every night that it isn't in the wash. 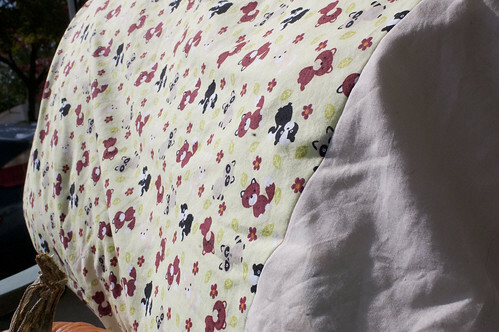 It's a pretty simple pillowcase made from the pattern in Heather Ross's Weekend Sewing . The fabric is one I bought from a fellow blogger. I paired it with a neutral for the edging and the success of this project inspired me to buy fabric for a specifically autumnal pillow for N. Which I did not make. WEEP! If it makes you feel better, I made quilts for the girls...but I have yet to make them little pillows...,or finish their embroidered pillow cases. Mothers have energy, but not limitless energy.by the way, really like the fabric! Angie, the fabric was so cute for a child, but not super cutesy and NOT BRANDED, and I fell in love with it. I wanted to make him something like a shirt out of it, but knew he would never wear it.